Origin/Ecology: Native from Pennsylvania to Iowa south to Georgia and Texas. Habit: Upright oval or rounded growth habit, growing 60-80′ tall. Leaves: Pinnate to bipinnate dark green leaves with ovate leaflets (1/2″ to 1 1/2″ long) cast a sun-dappled shade. Leaves turn an attractive yellow in fall. Flowers and Fruit: Inconspicuous, greenish yellow to greenish white flowers appear in racemes in late spring. Flowers are followed by long, twisted and flattened, dark purplish-brown seedpods (to 18″ long) which mature in late summer and persist well into winter. Water Use, Soil: Best in organically rich, moist, well-drained soils. Tolerant of a wide range of soils. Also tolerant of wind, high summer heat, drought and saline conditions. Landscape Uses: Recommended for lawns and streets. Limitations: Susceptible to many pests and diseases: leaf spot, canker, witches’ broom, powdery mildew, rust, borers, webworms, bagworms, plant bug, leafhopper, leaf miner, and spider mites. 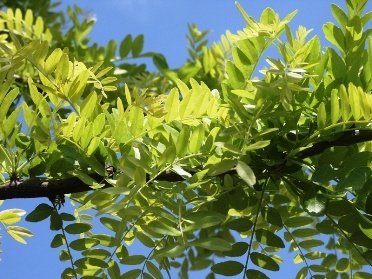 Other Features: Seedpods contain a sweet gummy substance that gives honey locust its common name. Tolerant to deer, drought, clay soil, Juglans nigra, air pollution.